Please let us know how we are doing by completing and answering the following form below. Feedback Rating Please select 5 stars for excellent and 1 star for poor. Your Zipcode: * Zipcode you call home. 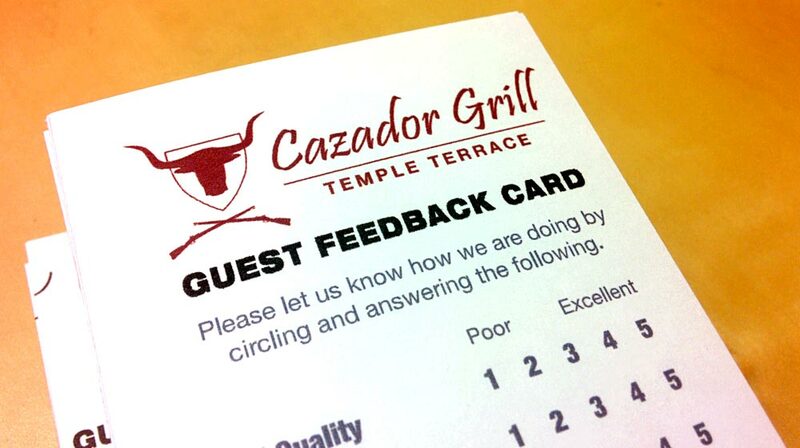 Let us know more about your experience at Cazador Grill. Guest Info Join our mailing list to receive info about special promotions and birthday/anniversary offers. Email * WE WILL NEVER SELL YOU EMAIL. A valid email is required to complete this form. You may choose to opt-out of communications below. Would you be interested in Cazador Grill offers? * Yes, Yes, Yes!Definitely, without a doubt!No, not at the moment. Phone We reserve the right to contact you regarding your opinion/review of Cazador Grill. Birthday mm-dd-yyyy Valid ID is required when redeeming birthday related offers.